I will have sections of my blog that I will title “Throwback Adventure”, and will plan on posting them every Thursday. These are journeys we have taken before I started the blog, but are well worth sharing. 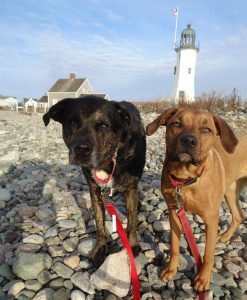 In February 2018 Shadow, Wilma, my Mom, and I Adventured to the Portland Breakwater Lighthouse in Portland, Maine. This Lighthouse if often referred to as “Bug Light” due its small size. The Portland Breakwater Lighthouse was built in 1875 and is known as one of the fancier lighthouses in Maine. It is an active lighthouse, and is located in Bug Light Park, providing views of the Casco Bay. We had an enjoyable Adventure The Portland Breakwater Lighthouse. The Lighthouse was located in a small and simple park, just a short walk from our car. We were pleased to get an up-close and personal view of the lighthouse, as we walked right up to and around this lovely structure. The lighthouse was very picturesque, bright white in color with decorative columns. We spent some time taking photographs before heading off to our next Adventure. We were pleased to view the lovely, and unique Portland Breakwater Lighthouse (Rating: 3).